NSERC Funding Overhaul Coming Soon | Mentor Works Ltd. The Natural Sciences Engineering Council of Canada (NSERC) is a federal government agency that bridges the research and innovation gap between industry and academia. By supporting collaborative research and development projects, NSERC enables industry innovations while also helping young innovators understand how research can lead to profound economic benefits. Since 2010, NSERC has provided research grants to more than 10,000 collaborations between 4,000+ companies and 150+ post-secondary research institutions. NSERC’s Engage and Collaborative Research and Development (CRD) programs extend government funding to accelerate research projects and support positive outcomes. Later in 2019, NSERC will consolidate and update these two incentives to create a new and improved funding program. While few details are currently known about this new stream of research funding, companies can expect it to be like the previous funding programs, but with a few distinct differences. Included in these changes will be broader eligibility criteria, a streamlined application process, and more flexibility to scale research projects as they progress from early research stages. What Does NSERC Funding Support? With an annual budget of $1.1 billion, the federal agency NSERC plays a pivotal role in connecting innovative businesses with post-secondary institutions. The agency currently maintains several research funding programs, including Engage and CRD, that reduce the research costs businesses would otherwise have to pay on their own. This eliminates post-secondary collaboration barriers and leads towards more innovative research. In addition to funding, NSERC can help businesses find the right research professor and team of researchers to assist industry projects. NSERC Engage Grants: The Engage program is designed to support short-term (4- to 6-month) research projects between one professor and one business. Available only to new collaborations, the program offers up to $25,000 in cash contributions from NSERC that directly offset college/university research fees. No company cash is required to participate, which makes it ideal for early-stage innovators moving an innovative product or process from proof-of-concept to advanced technology readiness levels. Engage grants can scale up to support projects requiring 6-12 months of research support through the add-on NSERC Engage Plus program, which provides up to an additional $12,500 in research grants. NSERC CRD Grants: Collaborative Research and Development (CRD) grants are generally meant for larger, longer-term research projects, either from first-time NSERC collaborators or companies that have previously used NSERC Engage funding. Unlike Engage, it supports research consortiums that include many businesses and many research partners. CRD typically provides up to half of the research project’s value in cash contributions, while industry provides the remaining project value in cash and in-kind contributions. Projects typically span 1-5 years in duration with no set maximum or minimum amount of funding that can be received, making it easy for industry to scale their project as needed. NSERC recently announced that later in 2019 it will update its funding suite by consolidating funding programs. Engage and CRD funding will be discontinued as discrete grants, with a new and improved funding program to replace them. While information around this new stream has not been formally provided yet, NSERC is advising businesses that there will be ample warning about when Engage and CRD applications must be submitted by to be considered. These programs are still open and are accepting/approving applications until details about the new stream are available. Accelerated means for projects to scale up. When details of the new program are made publicly available, Mentor Works will provide another update that explains how to qualify and apply for NSERC grants. Why Collaborate with Post-Secondary Researchers? Industry-academic research partnerships are essential to helping many businesses drive innovation. Canadian post-secondary institutions maintain knowledge and resources that can help accelerate research projects and lead to more successful outcomes; this provides real economic benefits for companies. Collaborative research partnerships can reduce time-to-market, helping innovators capture a larger market than otherwise possible while also reducing project costs. While many businesses would derive value from collaborative research projects, few engage post-secondary institutions for help. One of the reasons for this is that the process of working with a college or university seems complex when, in reality, it’s really quite simple. That’s why Mentor Works has developed a free resource that outlines the steps your business needs to take to establish a collaborative research project. 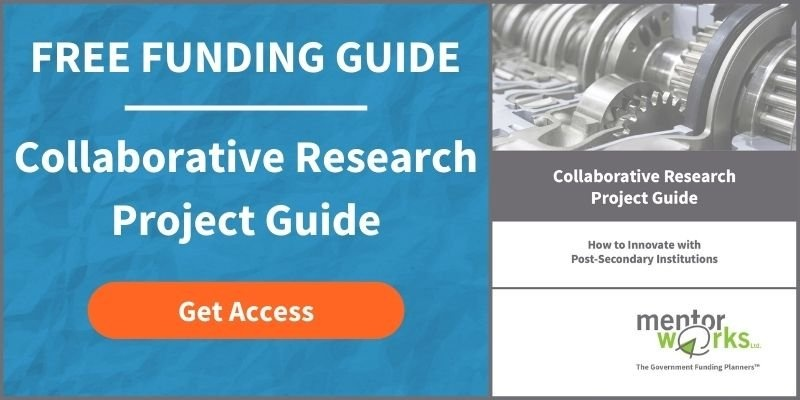 Download the Collaborative Research Project Guide to discover the benefits and step-by-step process of working with a post-secondary research institution.